The macadamia nut cream pie was not served alone, although it would have made a pretty enjoyable meal. 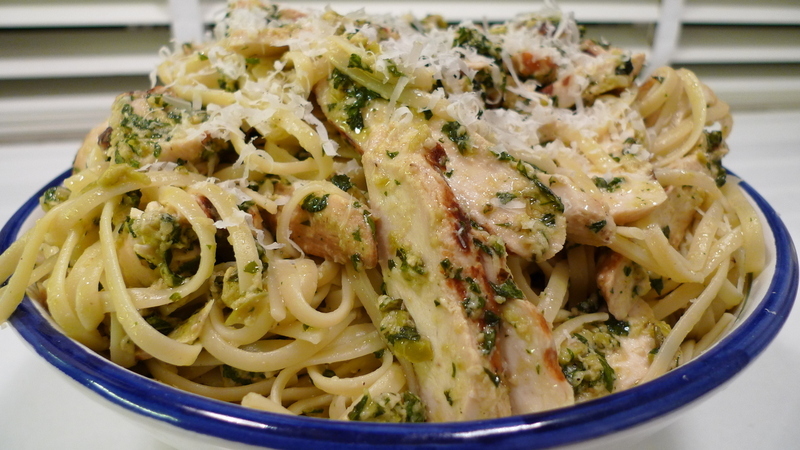 Instead, I served it with pasta in a green olive and mint pesto, a recipe I found on Domestic Daddy. The Domestic Daddy describes his site as “a fresh take on cooking, entertaining, decorating and other domestic arts and sciences from a real daddy … since my partner and I had our daughter Julia last year, I’ve learned to keep my projects simpler, faster and more fun.” Okay, Tawn and I don’t have a child, but the idea of keeping projects simpler, faster, and more fun appeals to all of us, right? The challenge for me is a lack of a food processor. Instead, I had to chop things by hand and I don’t think I got quite the consistency that I was looking for. Still, I ended up with this pesto that I then mixed into fettuccine. To add some protein, I marinated some chicken breasts in a buttermilk brine then grilled them in our quasi-panini grill. Sliced thin, they went into the past very nicely. To go with the homemade rye bread I roasted some heads of garlic. 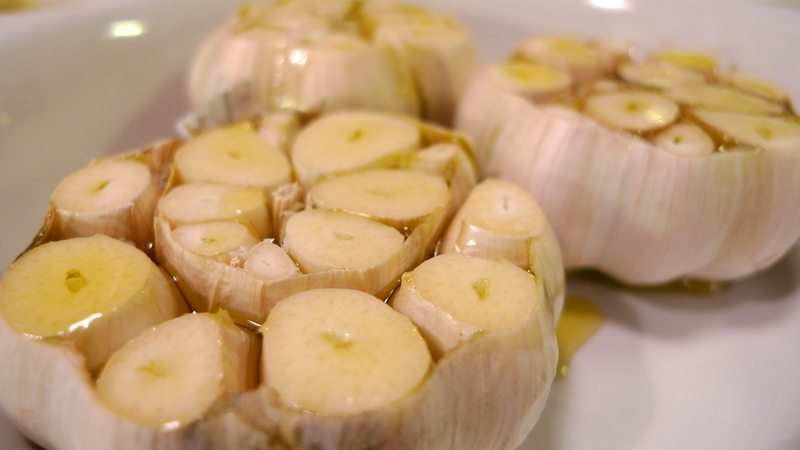 This is so easy that when I have the oven on for some other task, I like to roast garlic before turning it off. The harsh flavors turn mellow and you can mash up the garlic with a little olive oil and balsamic vinegar for a nice spread to put on the bread. Much more interesting than butter. I had to laugh to myself a little while I was preparing this. Those who criticize the “gay lifestyle” must be talking about our penchant for changing up traditional recipes (“pesto made with mint! 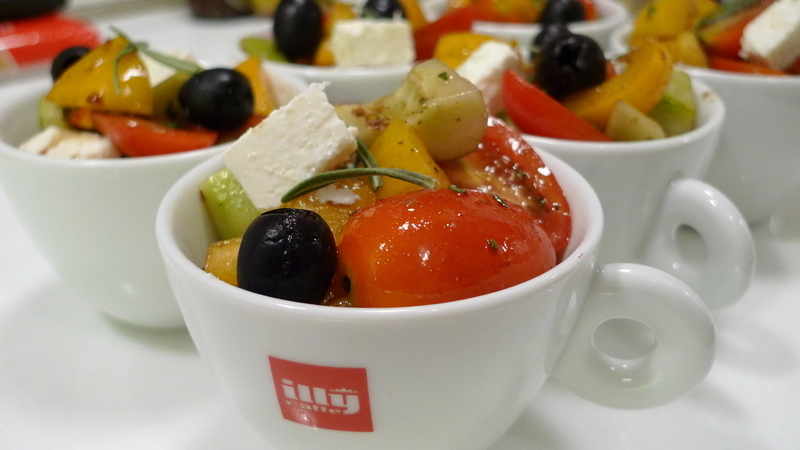 ?”) and ways of serving food (“Greek salad in a coffee cup!?”). Such an unconventional lot! 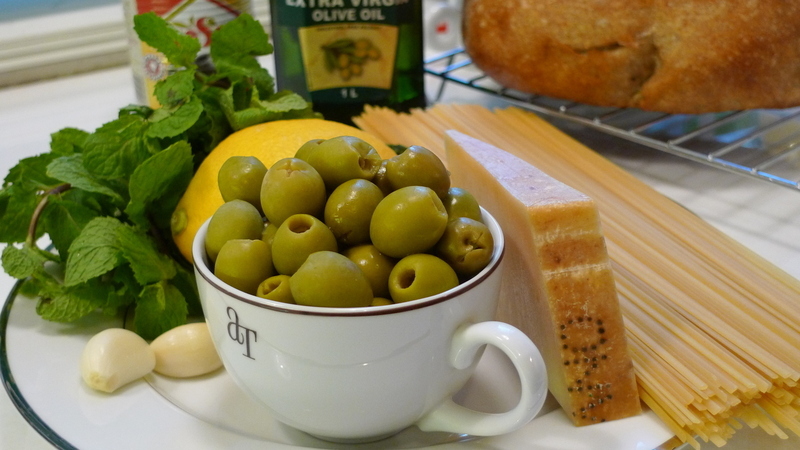 This entry was posted in Uncategorized and tagged cooking, Domestic Daddy, food, Garlic, Greek, Green Olive, lemon, Mint, Olive, pasta, Pesto, Salad by christao408. Bookmark the permalink. Whenever I feel like I need to get hungry before a meal, I just need to come to this blog and I’ll be set. Thanks! You did very well in improvising and mixing dishes. And back them up with excellent photography. you are very creative cook. YUMMMMMMY…. loveee pasta and cheese!!! Why do people criticize gay people for changing things up! Isn’t that just called innovation, something any good chef would do? Very nice. My friends had the pasta when I was over at their place last week. 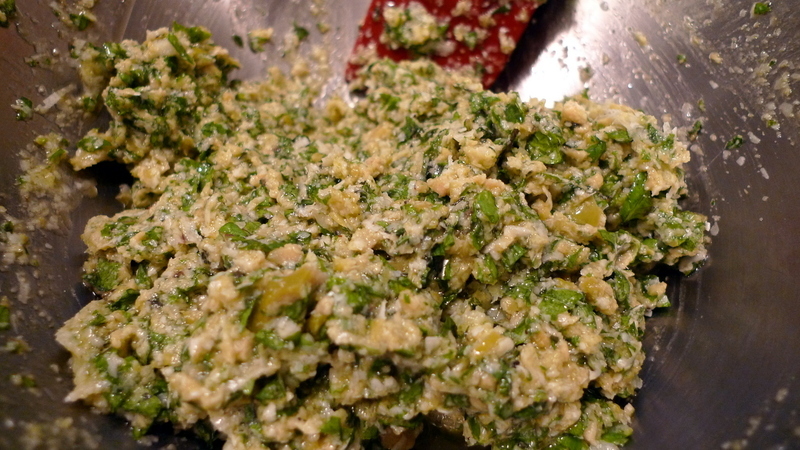 I love green olives (to be honest, I love all olives) and this pesto is something I am going to have to try. The tomato based sauces really mess with my gastric reflux problem… so I’ve gone almost entirely to alfredo and pesto on pasta. Lovely and now I’m really hungry. Guess I’ll be making pasta for dinner! I love all this! I added it to my Monday Magazine post. Wow. Next time you’re in the US … could you detour, and come cook for me? lol… You always make beautiful, appetizing food… I love that you share it with the interwebz. The pesto idea sounds really good. Hmm, I may have to give it a try! Thanx for sharing such awesome recipes!!! That’s a lovely recipe and I bet it tastes even better with chicken. Why must meat be so delicious? lol I might try these recipes someday. a very good take on the dish. great work! and yes, this kinda makes me hungry now. haha. I already ate, and this STILL makes me hungry. @AzureRecollections – The buttermilk, which you should be able to find in the dairy aisle up in Canada, works as a marinade. It is acidic and helps tenderize the chicken – but don’t use it more than about two hours or else it can turn the meat mushy. I find it works best as a brine, so stir in about 1 tbsp of salt with enough buttermilk to cover your chicken in a ziploc bag. Rinse the buttermlk off after marinating the chicken, patting the chicken dry with paper towels before going to the next step. If you can’t find buttermilk, you can create a substitute by adding 1 tbsp of white vinegar or lemon juice for each cup of milk. Stir briefly then let sit for five minutes. The milk will thicken slightly and have the same acidic tang as buttermilk. @AppsScraps – It was very different and when I first saw it, I had to think for a few moments before realizing just how good it would taste. @bumblefish – @seedsower – I’m very thankful to Seedsower for linking to me. @squeakysoul – The original recipe doesn’t have any meat in it. I added the meat mostly because one guest who came to dinner had an enormous appetite and I was concerned he wouldn’t feel satiated if he didn’t have some meat to go with it. You could certainly make it meatless. @ZSA_MD – Yes, those are my Illy Caffe cappuccino cups. I love the design of them and I use them more for serving small portions of food (or baking souffles in) than drinking coffee from them. @gasdoc73 – You are most welcome. @Domestic Daddy – I’m honored that you would add your comment here. Thanks for the work you do on your site. My husband introduced me to it, I think as a clever way to get me to do even more cooking for him! @Passionflwr86 – Absolutely. Have knife, will travel. Or you can come visit Thailand. @TheCheshireGrins – Welcome bag, Meg. I’m expecting a full recap of your meals in Italy. @murisopsis – I find the same thing sometimes with tomato sauce and enjoy having some options. A black olive and anchovy pesto would be really good, too. @brooklyn2028 – Oh, I don’t think anyone has actually criticized gay people for changing things up, Sheldon. I was just making fun of the “gay lifestyle” line that gets thrown around. @CurryPuffy – @yang1815 – Well, if I could get Andy to come over and photograph my food, it would look even better. @Roadlesstaken – Please think of my blog as an appetitif…@ItIsAllGravy – @im_numba_8 – @ItsWhatEyeKnow – @puella_sapiens216 – @SodomyClown – @chadwilly – @Fatcat723 – @Sinful_Sundae – @stevew918 – Thanks everyone for your kind words. I notice that a few of you are new here. Welcome and thank you for commenting. @christao408 – Haha thanks but it’s probably just the camera.